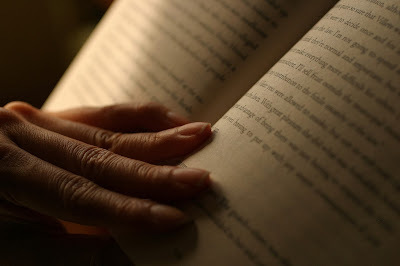 Everyone in this world has their own style of reading - some people read too fast, some read too slow, some speed-readers read vertically instead of horizontally, while the remaining are just plain lazy and take years to complete a good book! I have been discussing this with several people, and basically skimmed down to two broad reading styles which people follow - the first one is followed by Mrs Furobiker and the second by yours truly! Addicted Reading - Yes! That is what I call the first style of reading, which my wife follows. When she picks up a book, she just can't keep it down till she reads the end credits! I have seen her finishing those huge Harry Potter books in just one night (to be precise, from 8 pm on day one to 4.45 am on day 2!). I have seen a lot of friends following this style of reading, where they are completely focused on the book, and want to finish reading the book in max two or three sittings! However, I have observed that since the past year or so, I have moved on to a different style of reading. Savoured Reading - Yes, that's what I call my style of reading. I have come to believe that there are a plenty of similarities between a good book and a 30 year old, single malt scotch; hence, both of them should be treated with similar respect! As with single malt, you need to pour 10 ml in a crystal glass. It is not to be mixed with either water or ice. Then you shake your glass a bit, and then inhale the aroma that has been captured in the barrel for 30 years, while reading about the goodness of the malt on the bottle information sheet. Only after you have familiarized yourself with the aroma, you take a small sip, and let the scotch settle in your mouth. You roll it over your tongue, and feel it inside your mouth before letting it pass down your throat, marking your food pipe till your stomach! A good book, in my humble opinion, deserves a similar treatment! First, you tear away the packaging to get the feel of real paper in your hands. Then you flip swiftly through the pages, while breathing in the fragrance of crisp, newly printed paper. You should then always read the preface written by another classic author/editor. All classics have a preface written by some distinguished editor. Never glance through the summary at the back of the book. That tawdry summary is for the schoolkids. Post that start reading the book, but then take a break post 10-15 pages or one chapter as designated by the author. Close the book, and your eyes to savor the beauty and the deep meaning of the thoughts penned down by the author. Reflect on your opinion on the author's point of view. Only when you have completely absorbed the hidden meanings of the lines, pick that book up to continue. I usually take a week to 10 days to complete a book these days; sometimes even more based on the quantity of pages or the quality of the writing. Also, these days, I don't mind throwing out a book in between if I find it distasteful. So what type of reading style do you follow?